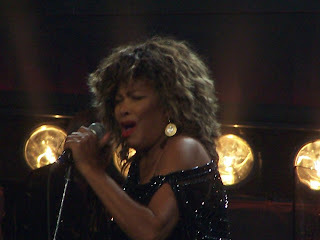 I don't quite know where to begin in describing what it was like for me to attend Tina Turner's opening night concert in Kansas City this past Wednesday. To say it was amazing, or fabulous, or incredible just doesn't do it justice. I don't even know if there is a word big enough to describe not only how great Tina was, but just how much it meant to me. he exudes positivity, refusing to let her past bring her down. I veiw her as a force of nature. She has not toured in almost 8 years, so this being her first full scale concert since then I expected it to be amazing. I just wasn't prepared for HOW amazing it was going to be. I have been so anxious for this show to happen. I had scored a second row ticket, and could not believe that I was going to be so close on opening night. My hands were shaking when I walked into the arena, and my whole body was just buzzing. I hit the souvineir stand and $260 later, I had my Tina goodies, and I was ready for the show. I was lucky to be seated close to several fan club members, so I at least had fun people around me who shared my enthusiasm. Finally after what seemed like forever the lights went out...The arena went crazy when the curtain opened and at last there she was. (And yes, for those of you wondering, I was crying my eyes out. 8 years of waiting definately had my emotions going.) Standing atop a two story elevating platform, looking every bit the icon she is, she ripped into Steamy Windows, and for the next 2.5 hours she tore the roof off the place. For anyone wondering, "Can she REALLY still do it at 68 years old?" , my answer is not only can she do it, she did it harder. She outdanced her dancers, outsang her backup singers. It was almost like she had full intention of proving to everyone she could still rock. And yes, the legs are still just ridiculous. She doesn't just look good for 68, she looks good for any age. She is timeless. The show was a straight ahead theatrical rock extravaganza. The end of the first act was We Don't Need Another Hero from Mad Max Beyond Thunderdome. Complete with a mini Thunderdome, Mad Max Characters, fireworks, and Tina dressed as her character from the film, Aunty Entity. It was so good, I thought I was going to die. And that was just act 1. 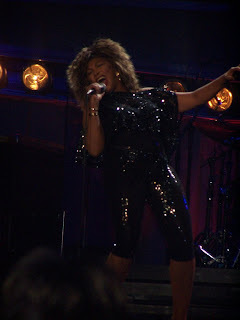 The second half of the show began much more low key with a video montage of Tina's career shown with the song I Don't Wanna Fight playing in the background. 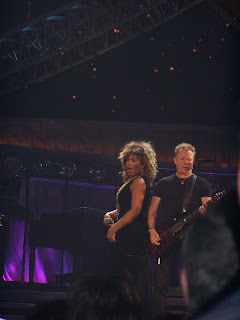 The screen lifted, and the curtain opened to find Tina and band in an unplugged setting performing the song Help, again, blowing the roof off the place. My fave is hearing Let's Stay Together unplugged like that, and again I was left in tears. Her voice is simply amazing. Goldeneye kicked off the climax of the show, with a giant "golden eye" ala James Bond opening up to reveal Tina in a floor length gown , looking every bit the Bond girl. This dress ripped off to reveal a tiny mini skirt for Addicted To Love, Simply The Best (again I was in tears. It's my all time fave Tina song. I had been waiting 8 years to hear it live again), and then the obligatory Proud Mary. 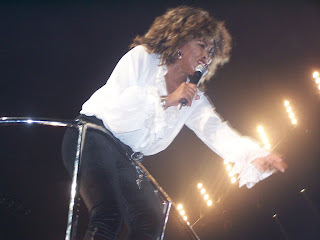 The encore was Nutbush City Limits, with Tina flying high above the crowd on a mechanical arm that carried her over the audience. The woman is 68 years old, and was dancing down the arm of this thing 20 feet in the air in 8 inch heels like it was nothing. After the final song Be Tender With Me Baby, Tina waved goodnight, and my heart felt so full I thought I was going to burst. It was so much more than I expected, and I expected ALOT. I never dreamed I could love her anymore than I already did, but I do. She is just absolutely the best thing ever. I still have not come down from the high of seeing her again, and luckily I get to go do it all again this coming Wednesday, once again in Kansas City!